Synopsis: Post World War II, a British colonel and his wife are assigned to live in Hamburg during the post-war reconstruction, but tensions arise with the German who previously owned the house. 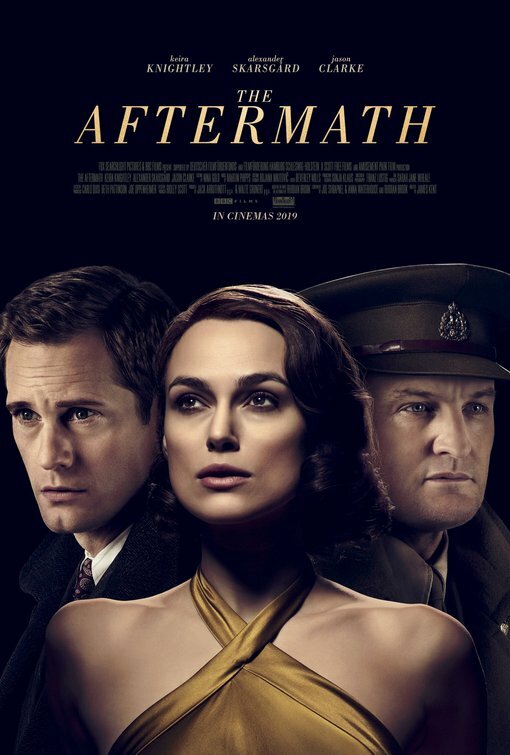 Review: You’d be forgiven if you glanced at the poster for The Aftermath and thought it was going to be more prestigious than it actually turns out being. I mean, you have period dramas #1 go-to-gal Keira Knightly front and center looking striking flanked by the brooding stares of Jason Clarke and Alexander Skarsgård. If you did further investigation you’d find out it was a post-WWII drama adapted from a bestseller which adds a little more fuel to the thinking that this would be a decent bit of counter-programming for a discerning adult audience as we move into the spring movie season. Alas, despite some handsome production values and the presence of the aforementioned stars, The Aftermath comes up far short of being anything to get excited about. Just a few steps up from a television soapy melodrama, it’s a strikingly ordinary bit of filmmaking that doesn’t bother to uncover the rich layers suggested by the source material or the performances the actors are trying to give. Based on Rhidian Brook’s 2013 novel of the same name, the film opens with Rachael (Knightley, The Nutcracker and the Four Realms) traveling to Hamburg to meet her husband Lewis (Clarke, All I See Is You), a colonel in the British Armed Forces. The couple lost their only child during the war as the result of a Nazi attack so Rachael traveling to the heart of Germany is anything but a welcome journey for the still-grieving mother. As she travels by train, she sees the devastating impact the war has had not just on the physical structures but on the emotions of the people that were left behind. Now, after its defeat, the country has begun the arduous process of rebuilding their cities under the watchful eye of foreign nationals. Lewis has commandeered a sprawling mansion for his military operation in Hamburg, which displaces the owner of the house a widowed German architect Stefan (Skarsgård, The Legend of Tarzan) and his young daughter, Susan (Flora Thiemann). Surprisingly, instead of fully asking Stefan to leave, Lewis attempts to forge new lines of compassion and allows the father and daughter to stay in the attic. This drives a deeper wedge between Lewis and Rachael, who can’t believe her husband is taking pity on anyone that might have been a Nazi sympathizer, though Stefan claims he was not. Eventually, Rachael begins to soften not only to Susan but to Stefan and before you know it…there’s a love triangle afoot. Having not read the book, I’m not sure how many liberties director James Kent and screenwriters Joe Shrapnel and Anna Waterhouse took with the source material. Certainly there’s a decent set-up for a steamy romance between Germany and Great Britain but it’s handled in such a paint-by-numbers manner that there’s no thrill to any of it. At first, Rachael can’t stand Stefan but then she gets to know him and, guess what, she starts to like him! To their credit, Knightely and Skarsgård do their darndest to drum up some sparks but their early friction fails to lead to a bonfire of passion when they get down to it. Skarsgård especially looks totally lost and unsure how to handle a character that should be more complex than the screenwriters make him out to be. Only Clarke manages to work his way toward something interesting, presenting a man trying to forget the painful memories of his past by losing himself in the present. The Aftermath may turn out to be one of those films you make time for on a sick day when you want a starry drama but don’t feel like investing too much in anything happening on screen. You could honestly fall asleep for part of the movie and wake-up without losing much in the way of plot. Some movies are slow-burns, this one is just slow.